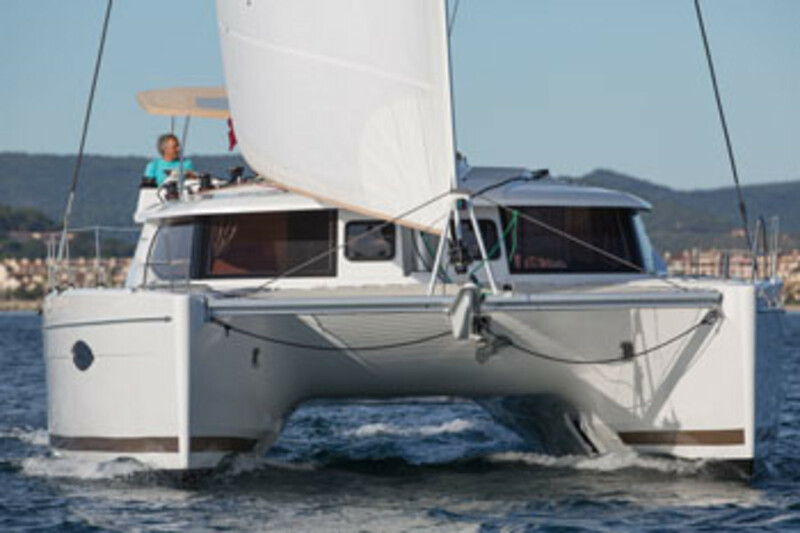 Although multihull innovation at the racing end of the spectrum gets the lion’s share of the press, no less of a revolution in design has been taking place among cruising multihulls: case in point, French multihull builder Fountaine Pajot’s new Hélia 44, a boat that in its own way is as cutting-edge as a carbon fiber racer. 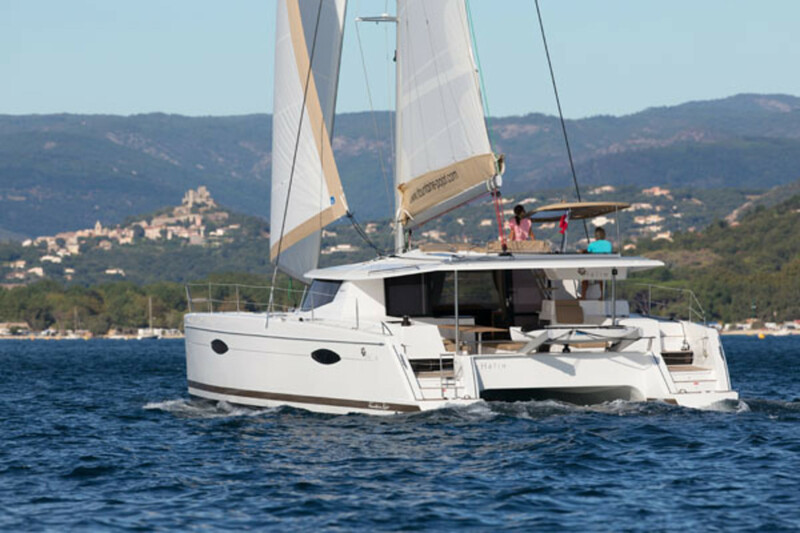 Structurally, the Berret Racoupeau design is tough and well engineered, which should come as no surprise given Fountaine Pajot’s position as one of the world’s leading multihull manufacturers. The boat’s hulls are balsa-cored and resin-infused in the interest of maximizing stiffness while minimizing the layup’s weight. A vinylester skin coat helps prevent blisters, and the deck is injection molded—again in the interest of reducing weight by minimizing the amount of material required to create a solid structure. The mast and boom are both aluminum. A fixed sprit projects beyond the forward crossbeam for flying a reaching spinnaker. The helm station is further linked to where the action is by a wide set of steps that transition into a short passageway leading directly to the starboard side deck. This short passageway also doubles as the working area for trimming the boat’s sails. It’s a little odd having the winches and stoppers for the sheets and halyards out of reach from the wheel. But at the same time, it opens things up nicely, providing plenty of room for cranking winch handles or sheeting in. If you have crew handy, of course, the distance becomes irrelevant. If you’re on your own, just pop on the autopilot to keep the boat on course while you’re doing your thing on the other side of the steering pedestal. 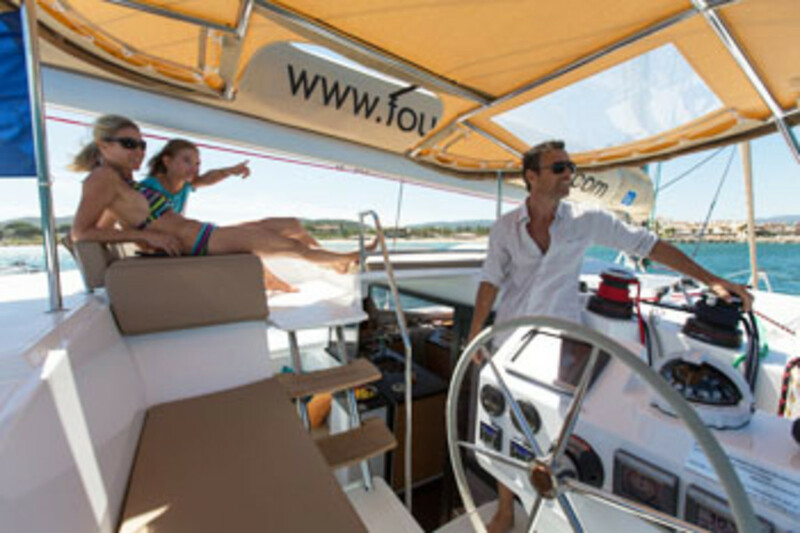 Fountaine Pajot and Berret Racoupeau have managed to incorporate all these cool features without making the boat look in any way top heavy. Indeed, the angular aesthetic approach of this boat is both businesslike and very satisfying—this despite a “roof” that extends far enough aft to not only shade the entire cockpit but support a pair of large solar panels, well clear of the aforementioned lounging area. The sidedecks are wide, uncluttered and enclosed by low bulwarks/toerails, providing clear and easy-to-negotiate way forward. I would have liked to have seen some good beefy handrails above the saloon windows, so there’d be something good and solid to grab onto when going forward in rougher conditions. But the thinking may be that in rough weather there’s little reason to go forward. To starboard of the well holding the windless is a large locker for storing things like docklines and large fenders. The cockpit is spacious, elegant and comfortable, with a large dining table and benches. As evidence of the fact that Fontaine Pajot wants you to be happy, the company has included an exterior fridge so you won’t have to be troubled by going all the way to the galley for a cold drink. Aft of the lounging portion of the cockpit is an athwartships passageway running the width of the boat that provides easy access to the port side deck and a means of scampering from one hull to the other without disturbing the people serving the drinks out of the cockpit fridge. It also provides a clear working area for retrieving or launching the dinghy from a pair of beefy davits. 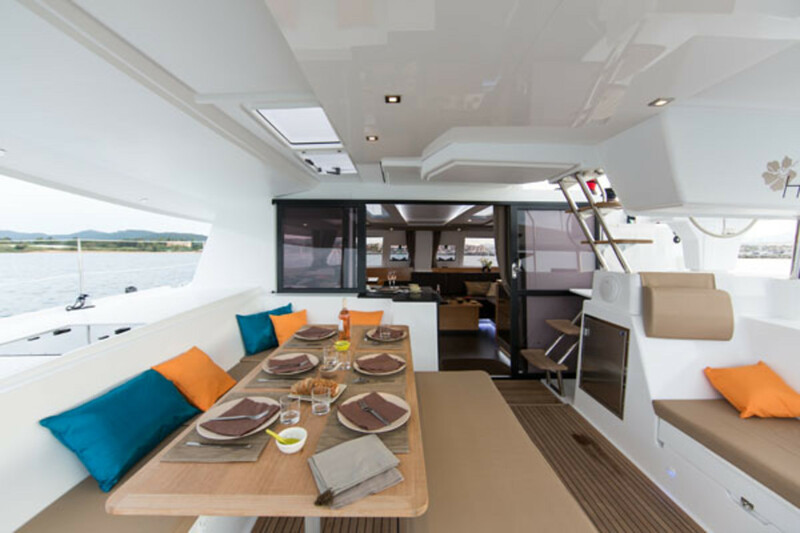 Saloon and galley are large, practical, suffused with light and configured to provide a seamless transition between the indoor spaces and cockpit. In both the three- and four-cabin layouts, everybody gets their own shower and head. The three-cabin version gives over the entire starboard hull to the owner’s quarters. What I really want to talk about here is light and ventilation belowdecks. This is another area in which the Hélia 44 is truly pushing the envelope. 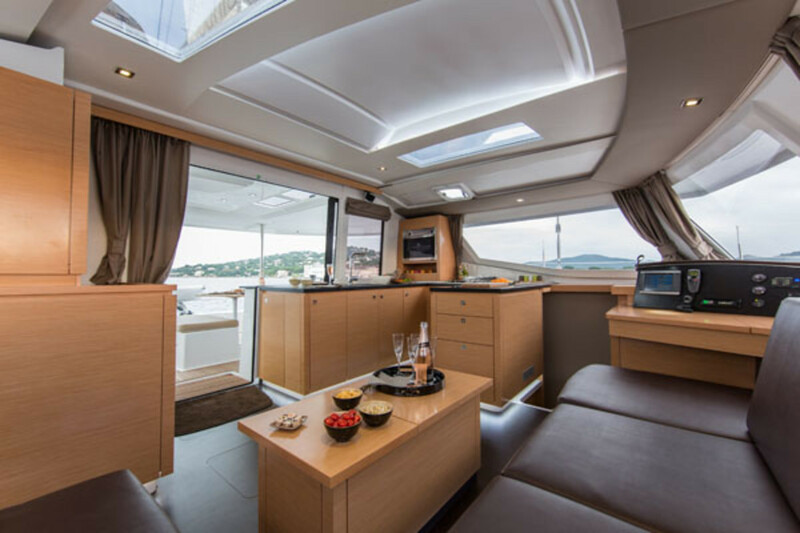 The combination of hull windows, conventional opening portlights and overhead hatches provide a level of lighting and air circulation that are truly incredible—never mind the immense size of the berths and generous headroom. The aft cabins in particular are well lit, thanks to a pair of nifty rectangular portlights looking out over the aforementioned athwartships passageway. Although there was little in the way of “helia” for our test sail, thanks to a low, autumnal overcast that was enshrouding Chesapeake Bay, the day was otherwise perfect, thanks to a chill wind blowing in the mid to high teens. Reaching back and forth off Eastport, Maryland, we easily managed 9 knots and more as the true wind speed fluctuated between 16 and 19 knots. As is often the case when I’m aboard a well-found multihull, I couldn’t stop marveling at how easy it all was. No heaving, no heeling, no spray, even with the moderate chop: just point the bow, trim the sails and watch the wake stretching out arrow-straight astern. Coming about was equally easy, and the helm was satisfyingly light and responsive, so that it was possible to play the shifts and get into a groove on the tighter reaching angles in particular, much like a monohull. With company president Jean-Francois Fountaine and a couple who’d recently placed an order for a Hélia 44 of their own aboard, we had plenty of crew to tend the lines in the working area forward of the helm. The electric halyard winch made short work of raising the main, and it was nice not having to watch out for flying elbows as I drove the boat through a series of tacks while someone else trimmed. When it came time to reluctantly give up the helm, I spent a few moments watching the wake unfurl behind us, thinking this is one boat I’d love to cover some serious passage miles on. No surprises here. Like any good cat, playing the engines made it possible to pirouette in place, even in a stiff breeze. Setting the twin saildrive-configured diesels at 2,000rpm gave us 7.5 knots of boatspeed, while cranking things up to 2,500rpm yielded just over 8 knots.